New York City Writing Project – Call for Submissions: Steal This Idea! Call for Submissions: Steal This Idea! Steal This Idea is a roundup of submissions from NYCWP-affiliated teachers; this section of our website will be updated frequently with great lessons and activities that you can use in your classrooms. Reading Steal This Idea will give you access to the ideas and innovations of a wide range of classroom teachers of all grades and content areas. The title says it all: if you like an idea you find there, bring it to your own classroom and make it your own! Steal This Idea started as a component of the NYCWP newsletter and has become an NYCWP tradition. However, this tradition relies on you to help! We need you to send us ideas that you would like the community to have the opportunity to steal. Have you done something in your classroom recently that went really well? Do you have a great idea for a lesson, unit or essential question? What’s a foolproof activity that everyone should have in their tool kit? What is your favorite thing that you do in your classroom? 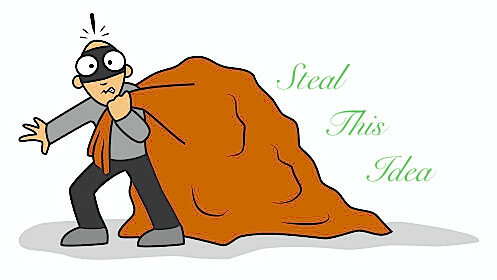 Send us your ideas–along with any accompanying images that you may have–and an optional headshot to admin@nycwritingproject.org with the subject line “Steal This Idea” and you may see yourself featured in the Steal This Idea section! *Note: By submitting an idea, you are claiming ownership and authorship of the idea. If you would like to send us an idea from a professional book you have read, please cite the source. If you co-designed the lesson, activity or idea, please offer credit to your team members, as well. next → TTT: How do we teach about Ferguson?